We know you love carrying around that tangled mess of a charging cable all snagged on other things in your bag, just so you can make sure that later in the day in the airport you can juice up that dying smart-device sidekick of yours, don’t you. Yeah, we know you do. No? You sure? Well then, you might hop at the chance to pitch in on this Indiegogo crowdfunding campaign and secure your very own flexible, colorful, ultra-portable, and plain darn cute lightning or micro USB (we could use both) cable. 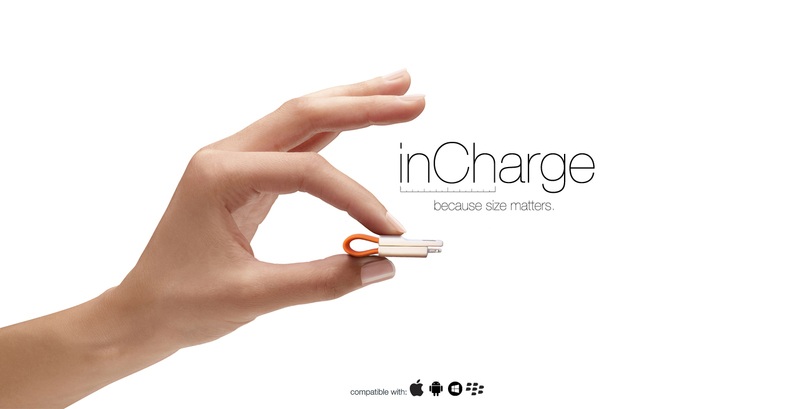 Dubbed the “inCharge”, the USB charging cable comes in at around 3 inches in length only, because hey, as the Italian student inventors Carlo and Lorenzo say on the campaign page, size matters (great to see people who get that as much as we do here at PortAbout.com). When folded over and attached to itself with its built-in magnets, it measures in at half that and is less than 1/3 of an inch thick. Now that’s portable. The idea here is that you can fold it over a keyring or some other carrying medium and easily take it with you wherever you go so that you’re never stuck without it. As they point out, the environments we find ourselves in these days often abound in USB ports, from computers to portable batteries and alternative energy sources to wall plugs; you just need the most stylish and functional cable for its size out there and you and your device are back in business. Coming to you from the Engineering department at the Politecnico di Milano in Milano, Italy, brothers Carlo and Lorenzo don’t really need your help anymore as their campaign is now overfunded by more than 700%. Then again, having reached over 800% of their $20k goal with still 20 days to go (hot damn! ), they were still searching (until very recently) for the one person who’d be willing to fork over the fine sum of $1,000 out of sheer affection for the two gents and the product and to take eventual ownership of the first prototype. Alas, this contribution-perk option has since disappeared from the campaign page, much to our sadness. They must want to keep the prototype for themselves. How selfish. However, while they presumably don’t need your support for product R&D or manufacturing anymore, you still need a slick new charging cable or 5 and they will be more than happy to help you out with that. They are even “optimistic” about their ability to send yours to you in time for Christmas. Ho-ho-ho. Just $9 will get you a single cable in the color of your choice, international shipping included. Not bad. By contributing more, you can get a keyring, extra packaging, gift wrapping, or a family or mega pack. We like orange, green, and blue, no keyring, extra packaging, or gift wrapping necessary, many thanks. Toss your cellphone or other mobile device a lifeline, but please, keep it small.